Ich weiß, so bist du sehr gerührt. Passierte dir das auch einmal. Für dich nicht ohne allen Reiz. I know, you are too touched. Its grip has you not clutched. Is not among your stimuli. Sings a duly dulling lullaby. 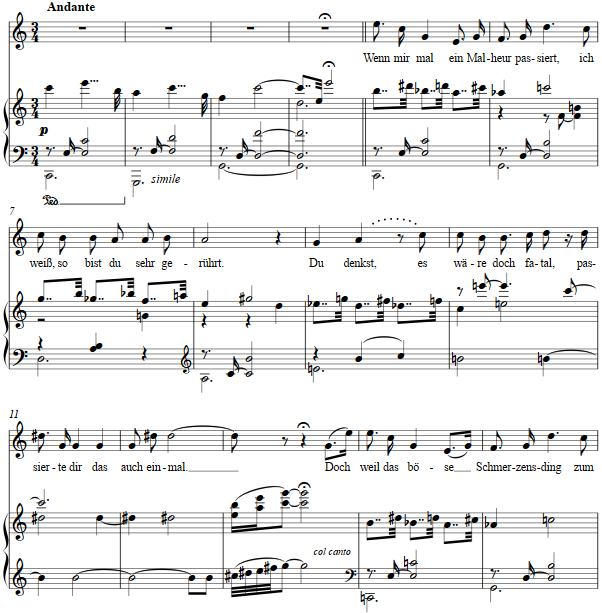 The setting is a waltz parody of sorts, the falling major thirds in the right hand double dotted and self-important as the short text is treated as if of two strophes. The text is found in the collection, Kritik des Herzens, 1874. For other settings of many of Busch's texts, click here.